A set up guide for sending LoRa data using the Arduino UNO with the RA-02 module by Ai-Thinker. I’ve seen a few people asking how to set this up in various places. It’s pretty easy once you know how to plug it together and which library to use. I’m using this library https://github.com/sandeepmistry/arduino-LoRa which is available in the Arduino IDE via Sketch > Include Library > Manage Libraries. Search for and then install LoRa by Sandeep Mistry as below. If you have the same basic RA-02 Module that I bought, it’s going to be pretty tricky to solder connections. The module is 15mm wide so the pads on the back are tiny. I couldn’t find a breakout board for this so I used one made for an ESP12 that I’d bought (http://cgi.ebay.es/ws/eBayISAPI.dll?item=262907685863). The spacing is the same and the pins I needed are all available. The video here is a bit long-winded but explains perfectly how to solder this type of module to a breakout board: https://www.youtube.com/watch?v=rGvvwXrv310 My effort isn’t as clean as the video! The wiring is pretty simple. For background you can read this page about SPI on the Arduino – https://www.arduino.cc/en/Reference/SPI and this page for the wiring the SX1278 https://github.com/sandeepmistry/arduino-LoRa#semtech-sx1276777879-wiring but it’s probably easier to just follow the diagram below. The pins on the RA-02 look like this with the board face up and the aerial socket top left. IMPORTANT ! Before connecting the module to power, install the aerial – push it firmly into place. The chip can be damaged if you try transmitting without the aerial. This is how I wired things up. The red and brown wires look similar in the photo so use the diagram above. When it’s all connected you can try some of the examples (File > Examples > LoRa) to see if things are generally working. I have a Heltec 32 LoRa Kit set up to receive packets (tutorial coming soon for this board). When I upload the example Sketch ‘LoRaSender’ to the Arduino UNO I see this on the serial output of the Heltec Board. Which shows that the loop in the Arduino code below is sending data via the SX1278 chip correctly. I am planning to buy this module. So I wanted to ask whether you have tested its range. Does it really work for a distance of 10km? I’ve not tested this module that much but this one https://robotzero.one/winext-sx1278-lora-module/ reached 3km line of sight. I’m going to test longer distances. It’s the same chip as the RA-02 but it comes with a better antenna. 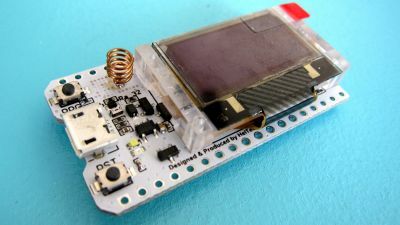 I have used ESP32 with SX1278 LoRa Module, applied two similar units – sender and receiver. SX-1278 has a max packet size of 256 bytes with bit rate upto 300 kbps. but it only sends one packet per second. Not sure how to increase number of packets per second. Receiver end – data is 1 packet / second (256 bytes / second) second packet is constantly missing. Do you have a sketch I could look at and maybe try? Why you dont use logic level converter 5 – 3.3V to connect 5V Arduino Uno with 3.3V RA-02? Module Ai-Thinker RA-02 have logic level converter inside? Oh.. I’ve realised what you meant. The pins for the communication on the UNO are at 5v so it could fry the ra-02. In my case it all seems OK though but maybe it would fail eventually due to this. “starting lora failed”, why ? Hi, I test this module. But it range is only 50cm…. I dont know why!! Can you tell me more about your system please? Do you have another device as a receiver to see if the data is being sent? I don’t think it’s this but make sure the Sketch and the Serial Monitor have the same baud rate set. I tried using LoRa sender and receiver code. Sender code seems to work fine. But I am not able to receive data on receiver side. Can anyone suggest, what could be the issue? in the serial monitor for the receiving Uno. I bought this module but it shipped with no antenna. I already bought wrong antenna. What kind of antenna can i buy for this? You need to use the whole example code in File > Examples > LoRa > LoRaSender . Not just paste the part I highlighted. Thanks, I was wondering if you tested with temperature sensor?